This rainforested, mountainous country is a popular port of call for several tourists heading to Thailand in search of sun, sea, and sand. But what beaches are best for those of us in a wheelchair? And what other attractions or activities are available in Phuket? 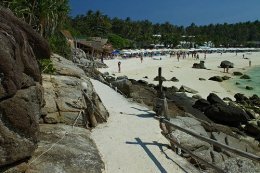 Karon – The second largest of Phuket’s tourist beaches and arguably the best for wheelchair users because there is a sidewalk running alongside. Rawait – Located near a sea gypsy village selling various handicrafts. Make your way along the pier and look at the fish through crystal clear water. Yanui – One of Phuket’s best-kept secrets, with few tourists even in high season, giving you more room for maneuverability. Kata – The smallest of Phuket’s main beaches, but perfect for swimming. From discovering the hidden treasures of Maphrao Bay to spotting native bird species and hand-feeding Macaque monkeys, the eco cruises that River Rovers have available are all wheelchair friendly. Several handicapped people find that the natural buoyancy of water provides essential pain relief to their ailments. But now there is the possibility to go scuba diving at the same time thanks to various organisations that purely work with the disabled and wheelchair users. Scuba Cat has a multipurpose building and underwater equipment that can accommodate disabled divers as they explore the mesmerising underwater marine life found around Phuket. You will be assessed before hand so that a suitable program can be put in place for your unique wants and needs. The elephant is Thailand’s national symbol, with some 100, 000 said to be domesticated back in the late 19th century. These days, the population has dropped to an estimated 2, 000, with poaching of protected species still a major problem. But at Siam Safari, the only Thai Government Certified elephant camp in Phuket, you can get up close and personal with these magnificent animals while also safeguarding their future. 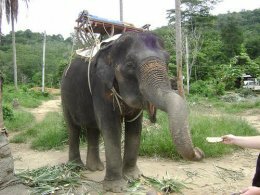 Wheelchair users find elephant treks here much easier than other places in Thailand due to the flat and level terrain. The fact you are in a wheelchair won’t matter if you choose to visit Phuket. You will not only be able to enjoy its beautiful beaches but also experience some of the attractions and activities that every other tourist loves about Thailand.